SAN FRANCISCO (AP) — Oracle Team USA skipper Jimmy Spithill rebounded from last place at the start of the Super Sunday fleet race finale Oct. 7 to win the America’s Cup World Series San Francisco championship. Spithill and his crew of Dirk de Ridder, John Kostecki, Jono MacBeth and Joe Newton fought their way back through the fleet for a 17-second win over Oracle’s other team, skippered by Russell Coutts. Spithill earned 40 points for the race and had 79 points for the series, tying him with British star Ben Ainslie of J.P. Morgan Ben Ainslie Racing. Spithill won the championship based on positions in the final race, in which Ainslie was fourth. On Oct. 6, Spithill won the match racing championship an hour after capsizing and breaking frames in the wingsail during a fleet race. The crew also won the August America’s Cup World Series San Francisco championship. Artemis Racing-White, skippered by Terry Hutchinson, finished third overall. Artemis Racing Emirates Team New Zealand (Dean Barker) placed fourth overall and Oracle Team USA Coutts placed fifth. 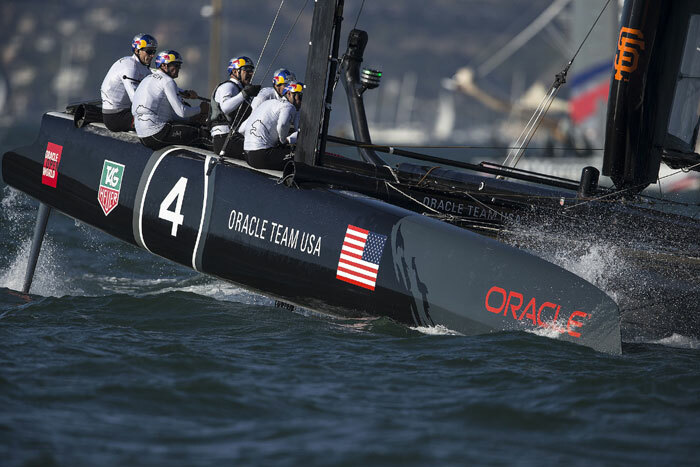 The next event in the America’s Cup World Series will be held April 16-24 in Venice, Italy. The actual competition for the America’s Cup is scheduled Sept. 7-23, 2013 on San Francisco Bay, in 72-foot catamarans. Spithill skippered BMW Oracle Racing to win the America’s Cup in 2010. ← Supreme Court to Decide: Is a Floating Home a Boat?